On Wednesday morning, the Associated Press reported that former Donald Trump campaign chairman Paul Manafort had drafted a proposal to help advance the business interests of Russian President Vladimir Putin in 2005. In light of that report, we’ve compiled this history of Manafort’s interactions with political campaigns and Russian interests. 1976. Manafort helps guide Republican presidential nominee Gerald R. Ford’s efforts at the Republican National Convention. 1980. After helping shepherd Ronald Reagan’s presidential campaign at the Republican convention, Manafort is a founder of the lobbying and strategy firm Black, Manafort, Stone & Kelly in Washington. The “Stone” in that title was for Roger Stone, a longtime Trump confidante. 1984. Manafort helps plan the convention for Reagan’s reelection bid. November 1985. Manafort’s firm is hired to represent Filipino dictator Ferdinand Marcos, apparently after being connected to Marcos via an emissary — Sen. Paul Laxalt of Nevada — sent by President Reagan. (This history comes from Ken Vogel’s thorough look at the relationship.) Manafort’s firm is tasked with advising Marcos on public relations and electoral strategy. Feb. 25, 1986. Marcos flees the country. 1988. Manafort manages the convention for Republican presidential nominee George H.W. Bush. January 1991. Public relations firm Burson-Marsteller acquires Black, Manafort, Stone & Kelly. 1995. Manafort and partner Rick Davis found a new lobbying firm, Davis Manafort. 1996. Manafort manages Republican Robert J. Dole’s unsuccessful presidential campaign. Late 2004. Ukraine holds a series of elections in which fraud is rampant. Viktor Yanukovych of the Party of Regions, who came in second in the first round, wins a runoff in November. Outcry at alleged fraud leads the European Union to reject the runoff results; Ukrainians take to the streets in protest in what comes to be known as the Orange Revolution. On a third ballot, Yanukovych again loses. June 2005. According to the Associated Press, Manafort develops a strategic plan aimed at promoting the interests of the Russian government and President Vladimir Putin. “We are now of the belief that this model can greatly benefit the Putin Government if employed at the correct levels with the appropriate commitment to success,” Manafort wrote in the document. 2006. Manafort signs a $10 million-a-year agreement with the Russian oligarch Oleg Deripaska apparently based on that plan. The work is not conducted through Davis Manafort but through a separate corporation called LOAV Ltd. The relationship with Deripaska also connects Manafort to Yanukovych. At some point before parliamentary elections in March 2006, the Party of Regions officially hires Davis Manafort to help reshape the party’s image. The party gains a number of seats in the election, and Yanukovych becomes prime minister in August after extensive political wrangling. January 2006. Davis arranges a meeting between Deripaska and Sen. John McCain (R-Ariz.). The two would meet again in August. July 2006. Deripaska’s American visa is revoked. 2007. A secret ledger kept by the Party of Regions indicates that Manafort began receiving under-the-table payments at this point — nearly two dozen of them totaling nearly $13 million. Manafort denies the allegation. December 2007. Yanukovych is ousted as prime minister after parliamentary elections. Yulia Tymoshenko takes the position, becoming the first woman to do so. 2008. After the presidential election — Davis served as McCain’s campaign manager, creating some bad press for the candidate because of his business relationships — Davis Manafort is disbanded. 2009. Manafort’s business relationship with Deripaska continued until at least this point. It’s not clear when it ended again, according to the AP. February 2010. Yanukovych wins the presidency with Manafort’s help. Beforehand, Manafort warns that he’s concerned about voter fraud working against his client, echoing concerns raised by his next prominent client. 2012. The last secret payment to Manafort is listed in the ledger. Feb. 21, 2014. After prolonged protests beginning in November the year before, Yanukovych flees to Russia. The next day, he’s officially removed from his post. This triggers Russia’s incursion into Ukraine and the annexation of Crimea. September 2014. Manafort flies to Ukraine to try to help Yanukovych’s former party once again gain power. The party is rebranded as the Oppo Bloc, at Manafort’s suggestion. March 28, 2016. Manafort is hired by Trump to guide the campaign’s delegate-wrangling effort in the lead-up to the Republican convention. He’s recommended for the position by Roger Stone. Spring 2016. According to the Times, the FBI begins investigating Manafort’s business relationships and ties to foreign powers, including Russia. In this time period, the Democratic National Committee’s email system is hacked by people who U.S. authorities believe are linked to the Russian government. June 21. After months of tension between himself and campaign manager Corey Lewandowski, Lewandowski is fired. Manafort becomes campaign chairman. Week of July 11. At the national security platform meeting establishing the Republican Party positions on the subject, representatives of the Trump campaign intervene to remove a call for arming the Ukrainian military to battle Russian and rebel fighters in the eastern part of the country. July 18. The convention begins. Trump is nominated. July 22. The emails hacked from the Democratic National Committee are released by WikiLeaks. Aug. 14. The secret ledger comes to light. Aug. 17. Reports emerge that Manafort also helped the Party of Regions secretly route $2.2 million in unreported lobbying spending to D.C. in 2012. Aug. 19. Manafort quits the Trump campaign, at the request of the candidate. Among the reasons he was asked to resign were Trump’s dissatisfaction with his tactical advice, and news articles raising questions about his ties to Russia and Ukraine. 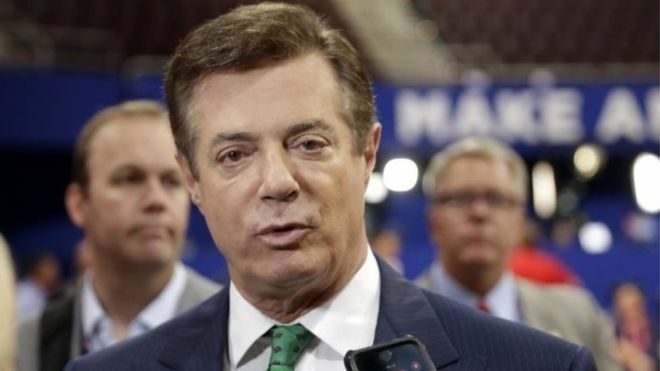 President Trump’s former campaign chairman acknowledged on Wednesday he had worked for a Russian billionaire about a decade ago, but he denied a report suggesting the lobbying efforts served Russian political interests. The Associated Press report on Paul Manafort comes amid swirling accusations – and congressional and FBI investigations – of Russian meddling in the U.S. presidential campaign and possible ties between Trump’s campaign and Kremlin operatives. The AP reported early Wednesday that Manafort worked for aluminum magnate Oleg Deripaska to advance the interests of Russian President Vladimir Putin and proposed a political strategy to undermine anti-Russian opposition across former Soviet republics. The report said the revelation may contradict assertions by the Trump administration and Manafort himself that he never worked for Russian interests. But Manafort noted his advocacy for Deripaska predated his own association with Trump’s campaign and suggested his services did not amount to lobbying for Russian interests. Manafort is reportedly one of the Trump associates being examined by the FBI for possible links to Russia. Manafort worked for Deripaska from 2006 to 2009, the AP reported, and the two had a falling out over a Ukrainian TV investment in 2014 – a year before Trump announced he was running for the GOP presidential nomination. It's not uncommon for U.S. political consultants to work in campaigns abroad. Strategy memos obtained by the AP allegedly show Manafort told Deripaska that he and Putin – who is reportedly close to the billionaire magnate – would benefit from a lobbying campaign focused on Western governments, particularly the U.S. The campaign’s goal: allow oligarchs to keep possession of formerly state-owned assets in Ukraine. “We are now of the belief that this model can greatly benefit the Putin Government if employed at the correct levels with the appropriate commitment to success,” Manafort allegedly wrote in a 2005 memo. Manafort left the Trump campaign in August after it was revealed the longtime operator had worked for the pro-Russian party of ex-Ukraine President Viktor Yanukovych. 0 Response to "Timeline: Paul Manafort’s long, murky history of political interventions"